What can SLTs learn from cancer trials? Let me take you back to the beginning. When I first applied for my NIHR fellowship I had to put down a training plan – and cost for this – in my application. At my consequent interview one of the points made by the reviewers was that I would need more training in trials and mixed methods. To this end I have sought out various training opportunities to equip me with more of these skills. Frequently this has meant attending courses not entirely designed for the likes of speech and language therapists. But (I reflect frequently) this isn’t anything new for an SLT. We are often in the minority and by now I quite enjoy the challenge of trying to apply other perspectives to our work- or tweaking concepts to suit what we do! To address some of this feedback from the reviewers I recently attended a couple of half day courses designed for people involved in running cancer trials. One of the most important reflections I made during this course was around culture. 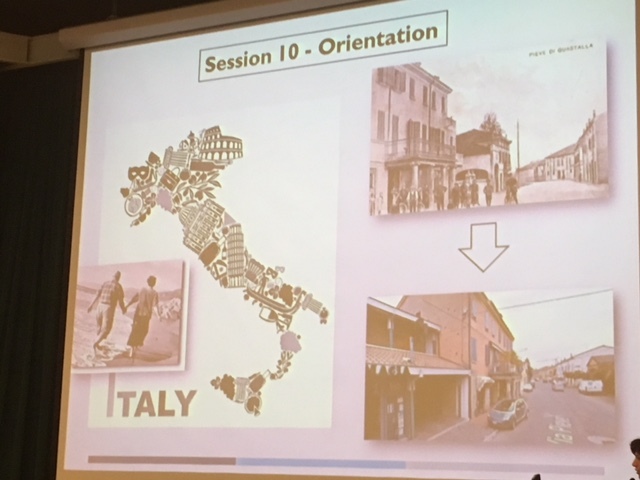 The course facilitator explained that around 20 years ago there were real difficulties recruiting people to participate in cancer research, Consequently the National Clinical Research Networks were set up. As a consequence of this organisation ( who provide research nurses and so forth to help recruit and collect data) it has become part of routine culture for people to participate in cancer research and around 1 in 6 people with cancer now participate in research. At present we have no such figures for SLT. There are lots of barriers to research in clinical SLT practice. Including culture – perhaps we need to consider how we can address some of these issues. Perhaps we actually need to do more research and more trials in clinical settings to break down this culture. For starters we need quite a large number of fairly homogenous patients to do a proper RCT. Or perhaps not. Perhaps simply using well matched or groups that are evenly heterogenous. Never the less we need quite a few people- perhaps we need to be attempting more multi-site and international collaborations? When we choose our comparator condition we might want to borrow from practice in cancer trials. Working with some of the rarer cancer groups does not warrant a “standard practice” comparator. Often there isn’t one that a ) is standard practice and b) is already proven. What about outcomes? We need to choose clinically relevant outcomes. Ones that change practice. Ones that convince the skeptics. But sometimes we aren’t able to quickly or easily measure the exact thing we are affecting. In these cases it’s OK to use a related or ‘surrogate’ measure in cancer trials. Perhaps we could fall back on confidence more often? Also of note- when you are piloting a research study (phase 2) you may not use the most meaningful measures but those which give you the information quickly in order to plan for the larger phase 3 RCT. Then use the most meaningful ones in that phase 3 trial. The cancer trialists will generally use a phase 1 study to identify maximum dosage- using a 3 by 3 design where 3 people are given a dosage calculated on the minimum required to make a change. If no one has an adverse event then 3 are given a higher does, this goes on until at least two people have adverse events in the group of 3. The level below is then deemed the maximum tolerated dosage. Can we reverse this model for SLT- can we work out the minimum dosage to make a change by reducing the dosage incrementally? We need to know what the minimum dosage is that commissioners should fund. So can we borrow models like this? In cancer trials tumour size is often used as an outcome. In these cases the tumour is measured at baseline, then during therapy, after therapy and then some time later. If the tumour shrinks by more than 30% this is deemed a partial response, if it increases by more than 20% this is a progressive disease. If it remains within the 20% or the 30% boundaries this is stable disease. Could we consider some of these percentage thresholds as applicable to our progressive patients? It is ever so difficult to measure if therapy is effective in progressive aphasia and stable disease is difficult to define. Perhaps we don’t need to re-invent the wheel? Can we model their response models? My second supervisor, Aimee Spector, and I. 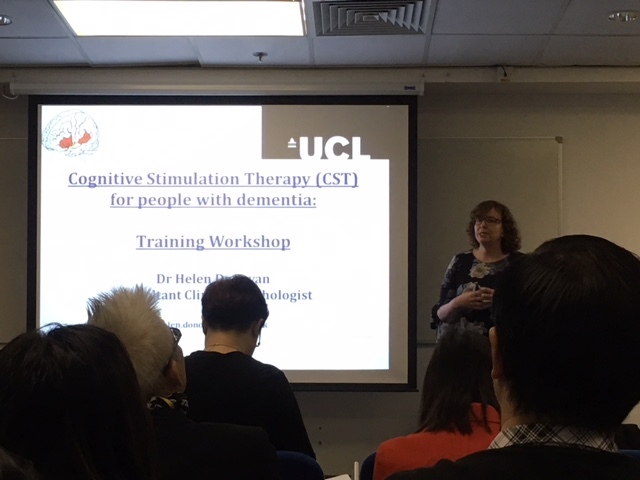 As a clinical SLT working with older adults I used Cognitive Stimulation Therapy or CST when I first started on the inpatient dementia wards at the Maudsley hospital. We used to run groups (the Occupational Therapist and I) with around 4-8 participants. The groups ran twice a week for 7 weeks using a manual to guide us. The manual provided guidance on activities- inviting participants to choose a group name and a group song which we used ever week. Orientation tasks, and a main activity each week such as word games. If I am honest I didn’t really know much about CST at this point. I just knew it was well thought of and well received. It was valued both by the team and the patients. I had never been trained in this. I just got on with it. I did go away and look it up though. 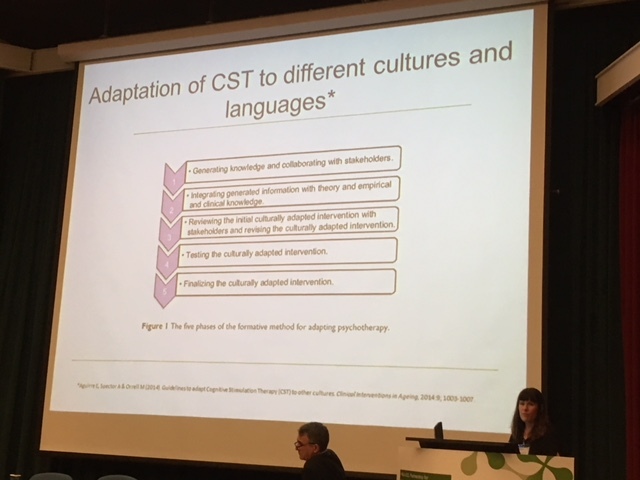 That is when I really recognised that CST was a well evidenced approach- a randomised controlled trial (RCT) had demonstrated improvements in quality of life and communication for people with mild-moderate dementia participating in groups at care homes in the UK. 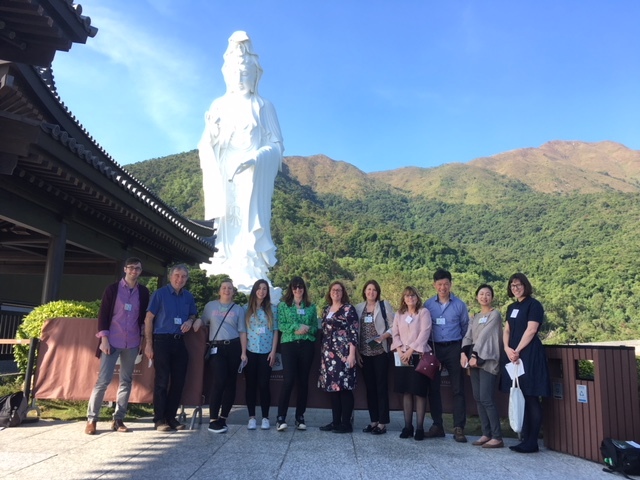 A few weeks ago, one of my supervisors suggested I might like to attend the 2nd International Cognitive Stimulation Therapy Conference with her……in Hong Kong. It was my supervisor who had done that RCT I described above. Obviously, I jumped at the chance. I speedily organised myself- submitted a poster, was accepted, booked attendance at the conference, a flight, accommodation and then of course arranged childcare. Right all sorted. This was an opportunity to learn from the masters- CST is THE non-pharmacological intervention recommended by the NICE dementia guidelines and in the International Alzheimer’s report. There is a Cochrane review demonstrating CST has positive outcomes for people with dementia. As a discipline, SLT can learn from this. As an individual, I was super excited to learn about this process and see if I could apply any of it to my work. I arrived in Hong Kong on Wednesday this week. 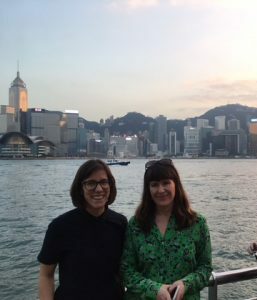 The taxi took me from the airport to Hong Kong Island where the university of Hong Kong (HKU) is located and I dove straight into a PhD meeting. Listening and sharing ideas between HKU and UCL students. On day two I attended a CST training day hosted by a wonderfully pragmatic psychologist from Bedford. 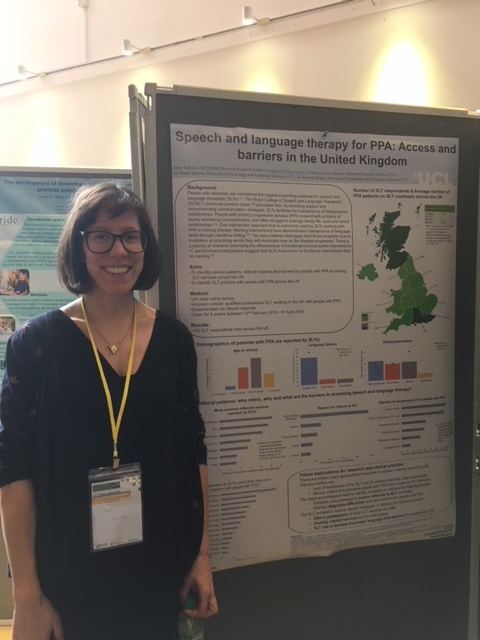 On day three I put my poster up and attended the first day of the conference proper. It was so stimulating. 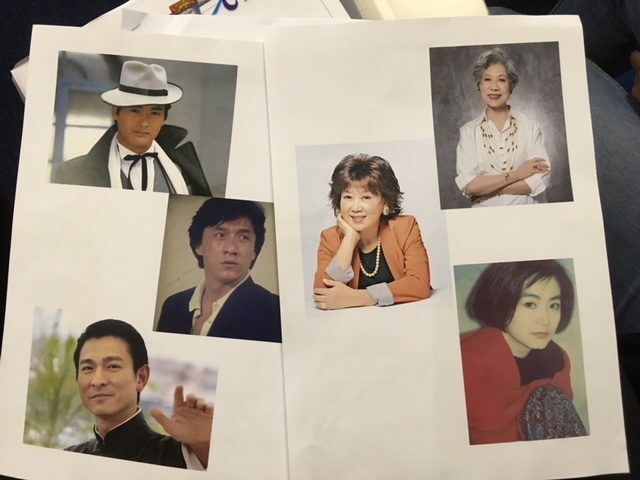 People presented from Hong Kong, England, Wales, China, Italy, Brazil, America, New Zealand, Holland, Denmark and more. There were representatives from even more countries than this in the audience. In fact, CST is being reportedly used across all continents of the world except Antarctica. It has been adapted and translated to suit the needs of all these cultures. 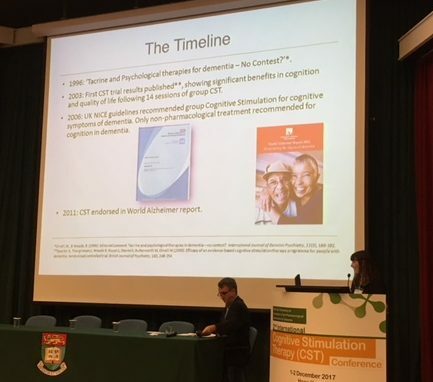 During the conference, we heard all about this- and about the other exciting ways in which the intervention has been developed and implemented to suit the needs of people with dementia. This was an inspiring meeting of minds, cultures and personalities. On Day four I attended the final day of the conference. And on day five I am flying home. Phew. CST has been updated, translated, adapted and refined. Pilot studies and consequent trials have confirmed its effectiveness across numerous countries. There is guidance for this process which includes consulting with local stakeholders to ensure its relevance. CST now also includes a maintenance program to support people beyond the course of the original intervention. Most recently the individualised CST manual has been designed, tested and trialed for delivery by caregivers (often family). There are also apps and video-conferencing CST on the horizon. Yet the research carries on. What is it that makes a good candidate for CST? Do neural substrates change as a result of CST? Does it work even better with exercise alongside? It is so valuable to understand this process. To see an evidence based intervention being developed, refined, piloted, tested, implemented and adapted. Yet this is only one intervention. One of the founding members of CST; Bob Woods, highlighted that people with PPA should receive CST alongside other evidence based cognitive rehabilitation interventions. 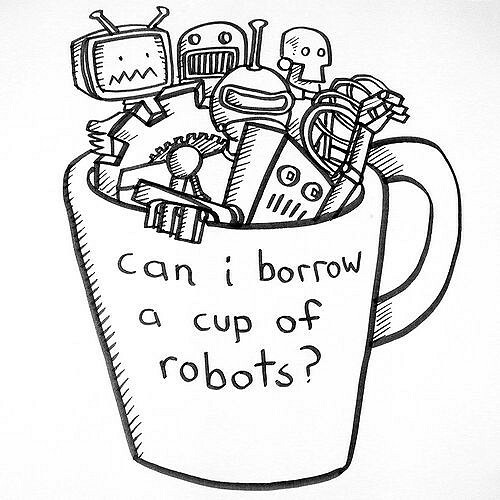 Better Conversations could be one such intervention. The appetite for well designed, evidence based interventions is there. The aging population continues to increase throughout the world. I feel inspired to ensure I continue to endeavour to develop the research around Better Conversations with PPA. I feel that rigorous research and a well-considered, thorough implementation process can work. I have made so many friends and developed so many relationships with people who are excited about what I am doing as well as what CST offers. Right so back to the grindstone – I must get on with actually doing it now.